NYC, 02/06/2019, 11:15AM. Gentleman Jim (1942): Rising Star Of Modern Boxing. 104 min. Director: Raoul Walsh. 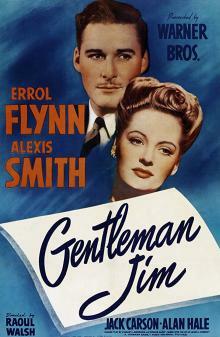 Starring Errol Flynn, Alexis Smith, Jack Carson. Gentleman Jim was based upon Jim Corbett's autobiography, The Roar of the Crowd. Flynn collapsed on set because of a mild heart attack on 15 July 1942, while filming a boxing scene with Ward Bond. Filming had to be shut down while he recovered; he returned a week later.